The proposed experiment in this paper tests the performance of heat pipe working fluids. It will concentrate on fluids that work in a low temperature environment. The testing facility necessary is described in the first section of this paper. The general mechanisms by which heat pipes work are described. Explanations regarding thermal conductivity and phase transition are given. Other principles which are critical to understanding the way heat pipes work such as cold and hot interfaces are discussed. There are two literature reviews included. The first of these is concerned with the general performance of heat pipe working fluids over a wide range of temperatures. The 2nd literature review concentrates on mixtures of fluids. There is a concentration on azeotropes with a special focus on those containing water. Table 1 outlines working fluids over a wide range of temperatures. Table 2describes the properties of water azeotropes. The conclusion describes the broad range of applications for which he pumps are being utilized. The apparatus for testing will consist of a heat pipe with thermocouples. On one end of the heat pipe is a heater, while the other end is composed of a cooling block, there is a power supply and measurement system attached to the heater. The measurement system is also attached to a data acquisition system which leads to a computer used for analysis. Attached to the cooling block is a cooling bath. The temperature at which the heat pipe is operating will be controlled by the cooling block. The cooling bath is used to maintain the coolant at the proper operating temperature. The heat source will be connected to an evaporator. The power input can be direct current war alternating current. The amount of current used should be recorded with multimeters which send signals to a personal computer. The computer can be used to control the entire system and monitor all operations. It is necessary that the heat source be insulated in order to reduce convective losses of heat, which would skew the results. The data which is measured is sent to the data acquisition system. This system is controlled by the computer and communicates with it. Before the experiment is conducted the entire system must be allowed to reach a steady state. This will enable the heat pipe and cooling media to have constant temperatures. Once the steady-state is reached, there can be an increase in power to the system which is done in minute increments. It is likely that the heat stabilization will require up to 30 minutes before a steady-state can be achieved. Each of the slight increases in power to the system can occur between 5 and 30 minutes. There will be a recording of both the temperature and power input of the system. Analysis of this data will be done by the researcher using the computer. It is important that the working fluid be treated with care. The fluid samples used must be of good quality and high purity. It may be necessary to purify these chemicals prior to the experiment. This can be accomplished by distillation. The amount of working fluid necessary will be determined by the volume of the fluid which is required in a number of different structures. These structures consist of the cornered regions, grooves, arteries, and wicking structure. The amount of fluid which is used is important because it affects the heat transfer of the heat pipe. It also affects the general performance. When the proper amount of working fluid has been determined, there are a number of techniques, which can be used for placing the fluid within the heat pipe. These techniques include the supercritical vapor technique, sublimation and a solid fill, liquid fill and vapor generation, as well as backfilling and evacuation. All of these methods are used to minimize noncondensing substances from being introduced into the heat pipe when it is being filled. A proper technique will involve the use of a filling rig and method of evacuating the heat pipe. The apparatus must allow the heat pipe to be evacuated to 10-4 torr or lower. The precise method with which each fluid will be introduced to the heat pipe depends upon the state the working fluid is in at room temperature. The majority of these systems are constructed with plastic, stainless steel, or glass. Glass is an especially good material for this type of work since the liquid droplets can be observed when they are in a vacuum. This allows the researcher to study their vaporization visually. Stainless steel is the strongest of the materials and can be used when a higher vacuum level is necessary. Plastic can be used as an economic alternative. However, there are often materials used in this kind of work, which interact with the plastic in a multitude of ways. If plastic is being used, and the researcher must be certain that it will not alter the test results. A heat pipe is a mechanism which transfers heat using both the phase transition and thermal conductivity. It is an efficient mechanism for heat transfer management between two interfaces, which are solid. A heat pipe has both a cold and hot interface. The hot interface is at a lower pressure and causes the working liquid to transform into a vapor through the absorption of heat from the hotter surface of the interface. The cold interface causes the vapor to change back into a liquid which releases heat. This liquid can then be sent back to the hot surface by gravity or capillary action where the process begins again with the liquid turning into a vapor. The pressure within the heat pipe can be adjusted in order to maximally facilitate that the phase change. The best temperature will depend on the application for which the heat pipe is being used. The majority of heat pipes consist of a sealed tube comprised of material which has a high thermal conductivity. This material is used at both the cold and hot and can consist of metals such as aluminum or copper. All the air is removed from the heat pipe by a vacuum pump. The pipe can then be filled with the working fluid which is sometimes known as a coolant. The type of working fluid used is determined by the operating temperature of the heat pipe. Many different types of working fluids are used such as mercury, sodium, acetone, alcohols, and water. The lower pressure in the pipe causes the fluid to partially vaporize. This means there will be both a fluid and a liquid phase within the pipe. The vacuum allows the working gas to be used directly rather than passing through another gas. This increases efficiency because the vapor passing to the cold end of the heat pipe moves with the speed of the molecules. This means a heat pipe is a rapid method of heat transfer which is only limited by the speed with which the paper changes to a liquid at the cold end of the pipe. Of the material and working fluid for a heat pipe are determined by the temperature and conditions in which the pipe is being used. There are a number of different coolants, which can be used that vary in their efficiency depending on the application temperature. For example, helium can be used for temperatures ranging from between 2 and 4° Kelvin. Between 523 and 923° Kelvin Mercury is efficient. Sodium has relatively good efficiency between 873 and 1473° Kelvin. Liquid absorption capability of the pipe wall and wick. Thermal stability of the fluid. Compatibility of the fluid with the wall material and wick. The thermal conductivity of the liquid. Vapor pressure which is acceptable given the particular operating range of the heat pipe. The latent heat of the liquid. The viscosity of the chosen liquid in both its fluid and gaseous form. Pour and freezing points, which are acceptable. There are a number of thermodynamic factors, which must be taken into account when choosing an appropriate working fluid for heat pipe. These include factors such as boiling levels, including those of the nucleate, entrainment, capillary, sonic, and viscous types. It is generally an advantage to have a working fluid which has high surface tension. This will allow the heat pipe to work against the pull of gravity when necessary. A surface tension which is high produces a superior capillary driving force. A good working fluid must also be able to infiltrate the container and wick material when in its liquid form. When in the gaseous form the working fluid must have sufficient vapor pressure in the operating temperature range in order to avoid vapor velocities, which are excessive. If the vapor velocities are too high there can be flow instabilities due to high temperature gradients. Heat pipes can be conceptualized as working in four basic ranges, which include cryogenic, low temperature, medium temperature, and high temperature. The cryogenic heat pipes have working fluids, which operate between 1 and 200° Kelvin. These generally consist of compounds such as oxygen, nitrogen, neon, helium, and argon. These fluids have heat transfer capabilities, which are superior. The surface tensions are also minimal. Low temperature heat pipes will be the focus of this dissertation and operate at ranges between 200 and 550° Kelvin. Common working fluids at this temperature are water, acetone, ammonia, ethanol, and methanol. Medium temperature heat pipes work between 550 and 700° Kelvin. Sulfur and mercury are common working fluids in these types of heat pipes. High temperature heat pipes work at temperatures above 700° Kelvin. These often include compounds such as solar, sodium, and potassium. An extraordinarily high heat flux is necessary for these working fluids. The two most common working fluids for heat pipes are methanol and water. Under most conditions, water has thermodynamically superior properties to methanol. It is thus the fluid of choice for many applications. The range in which water is useful in a heat pipe is usually between 50 and 200°C. Methanol has a range which is lower at between 20 and 120°C. Methanol has a low temperature of freezing at -97°C. This means they can be especially useful when a heat pipe consists of a system which could be subject to freezing. However, a well-designed heat pipe can still use water even in cold temperatures because they are not damaged by freezing or calling of the liquid being used as the working fluid. These types of heat pipes simply stop working when the fluid is frozen. If the operation is necessary even at these low temperatures then methanol, or some other liquid, which has a low freezing temperature, must be used. When 2 or more liquids are mixed together and form a new compound which cannot be broken down by simple distillation, the resulting liquid is known as an azeotrope. This peculiar characteristic of the new chemical is due to the vapor having the same ratio of constituents that are present in the original mixture. Azeotropes were previously referred to as constant boiling mixtures. There is a wide variety of azeotropic mixtures with their own particular characteristics. An important distinction among azeotropes which is particularly important with regard to heat pipes is the boiling point of the mixture. An azeotrope can have a boiling point which is less than that of its constituents in which case it is considered a positive azeotrope. If the boiling point is lower than its constituents what it is said to be a negative azeotrope. The positive azeotrope is also known as the pressure maximum azeotropes or minimum boiling mixture. Likewise, the negative azeotropes are known as pressure minimum or maximum boiling mixtures. Azeotropes can be comprised of only two constituents in which case they are known as binary azeotropes. The azeotropes which have three constituents are known as tertiary azeotropes. This thesis will be concerned with binary azeotropes, which are efficient at lower temperatures. There are critical matters, which must be considered when choosing the best performing working fluid for a heat pipe. These factors are important for azeotrope as well. One of these factors is the surface tension. This is a force which acts in word and perpendicular to the boundary of a surface. Any heat pipe, it generally decreases the interface area. This results in the working liquid having a shape which uses the minimum amount of an area. If the inside of the pipe consists of a vacuum, then in zero gravity the liquid will be a perfect sphere. The surface tension is the result of repulsive and attractive forces on the molecules near the interface area. Thermodynamically the surface tension results from energy being stored in the molecules which are near the interface. This energy is in the form of hydrogen or metallic bonding, as well as dispersion forces. This tension in a liquid which is nonpolar is caused only by the dispersion forces. However, in liquids which are hydrogen bonded the dispersion forces and the hydrogen bonding contribute to the higher level of surface tension. There are especially high surface tensions in liquid metals, such as mercury, due to the dispersion forces being combined with a metallic force. This means the surface tension of a liquid metal is considerably higher than a liquid which is hydrogen bonded such as water. The surface tension also varies by temperature. When the temperature is increased, the surface tension will decrease. In the case of water, there is a nearly linear relationship between the temperature and surface tension. Another important factor which must be taken into consideration is the boiling limit of the working liquid. Any heat pipe, the boiling occurs in the wick near the evaporating wall. There is a thin film of evaporation present at the interface between the solid, liquid, and vapor. This area decreases quickly since the boiling condition will dominate the phase change within the system. The vapor which forms near the base of the wick prevents the working fluid from reentering the system. The conductivity of the paper is lower than the fluid. Therefore, the conductivity of the wick significantly decreases when this reaction occurs. Heat transfer due to boiling in the wick must be avoided since it can lead to the heat pipe drying out. Another important factor to consider when choosing a working fluid is the entrainment limit. When the liquid and vapor are flowing in opposite directions, there is a frictional shear stress that is present at the vapor-liquid interface. This can slow down the flow of liquid, which is returning to the evaporator. This causes the velocity of the vapor to increase. There is also an increase of the paper flow near the liquid-vapor interface. This reaction is dependent upon the surface tension. It is also dependent upon the viscosity of the liquid as well as the density of both the liquid and vapor phase. If the influence of the frictional shear upon the vapor-liquid interface is too large, the liquid will not return properly to the evaporator. This causes the evaporator to dry out. When this occurs the heat pipe has reached a heat transport limit. This is also known as the entrainment limit. This paper was a proposal for doing an experiment which would determine the relative effectiveness of different fluids in a heat pipe. Heat pipes are becoming increasingly important in the 21st-century. They are now being used for spacecraft, nuclear power cells, computers, and other electronic equipment. Heat pipes are useful in spacecraft because they can be used when extreme conditions are present. They also have no moving parts and are reliable when they are well designed. The increasing power and complexity of modern computers make cooling the system more important. He pipes can be used to cool GPU’s and CPUs by transferring their heat energy to heat sinks that dissipate the excess into the environment. Solar water heaters are becoming more popular with increased interest in the environment and the use of renewable sources of energy. He pipes are particularly good for this type of application. They are often combined with solar collector arrays and evacuated tube. This technology generally uses water as the working fluid within a heat pipe of copper. This copper heat pipe is placed within a glass tube which has been evacuated of air and is oriented to collect a maximal amount of energy from the sun. An especially interesting use of heat pipes is the Trans-Alaska Pipeline System which uses the technology to dissipate the heat in the oil. The oil passing in the pipeline contains ground heat. This would be transmitted down the support legs of the pipeline which is located on permafrost. This would result in the pipeline sinking. Each of the support legs for the pipeline has four heat pipes, which dissipate the heat to prevent melting of the permafrost. 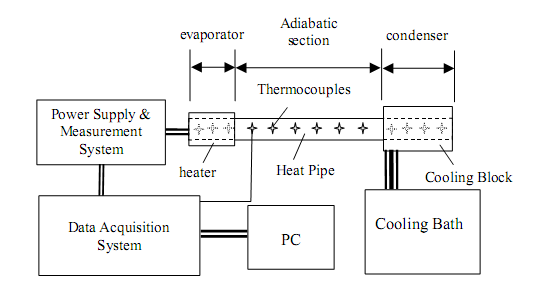 The experiment proposed in this paper will provide crucial information for the development of a high-performance, low temperature, heat pipe system. This will be a valuable addition to the knowledge base in this important area of scholarship. Bejan, A., & Kraus, A. D. Heat transfer handbook. Hoboken, New Jersey: Wiley. Dincer, I. Refrigeration systems and applications. Hoboken, New Jersey: Wiley. Dincer, I., & Kanoglu, M. Refrigeration systems and applications. (2nd ed.). West Sussex, UK: Wiley. Kutz, M. Mechanical engineers handbook. (3rd ed.). Hoboken, New Jersey: Wiley. Lide, D. R. CRC handbook of chemistry and physics. (90th ed.). Boca Raton, Florida: CRC Press/Taylor and Francis Group. Luyben, W. L., & Chien, I. Design and control of distillation systems for separating azeotropes. Hoboken, New Jersey: Wiley. Rathore, M. M., & Kapuno, P. R. Engineering heat transfer. London: Jones and Bartlett Learning International. Reay, D., & Kew, P. Heat pipes. (5th ed.). Oxford, UK: Butterworth-Heinemann. Smirnov, H. Transport phenomena in capillary-porous structures and heat pipes. Boca Raton, Florida: CRC Press/ Taylor and Francis Group. Speight, J. G., & Lange, N. A. Lange's handbook of chemistry. (16th ed.). New York: McGraw-Hill.